And so, while it isn’t Monday, it’s time to get back on track and start again to focus on my health and fitness, and work to bring the future that I imagine closer to the future that I will have. This came along at just the right time and is now the desktop on my computer so that it reminds me every time I mindlessly play solitaire and waste my time away, that I need to be making my future happen – and it won’t by sitting on the computer playing solitaire!! At the same time that I’m rebuilding and renewing on the health front, I’m redesigning the way I tackle the job hunt and starting to reach out to LinkedIn contacts and ask for help. You know, they thing “they” say is the “new and only way to find a job these days. It’s pretty much a full time job looking for a job – a job that will be fulfilling, challenging and rewarding, not just a job. So lots of renewal going on here. I hope you keep renewing every day, as well. 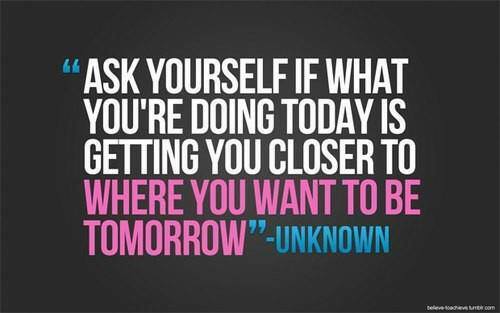 Make sure what you are doing today is getting you closer to your tomorrow! Previous Wasted Next Didn’t see that coming! If you want me to go over your resume, you know how to reach me. Mine seems to be brilliant, because I send it out and get interviews 50% of the time and 25% of the time I get the job. That is kind of unheard of for resumes, even good ones.